X-frame machine housings – the flexible solution for the mechanical engineering sector. Each machine cell is functionally different from the other one, but they have all one thing in common: they are designed to your specific requirements and must be able to grow in line with the requirements. That's why we developed X-frame – a modular system which offers maximum flexibility in the implementation of your customized solutions. pneumatic or hydraulic installations etc. The manufacturing of single cells e.g. 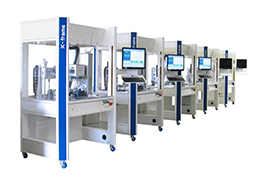 : for assembly stations or test systems, upgrading or adaption of the control technology can be simply realized with the X-frame system. Change your machine frame into a flexible system that grows in line with your requirements – we support you! Modular system for an internal standard: Owing to its modular structure, the X-frame is the perfect standard for various product ranges, one-off production or customized solutions. 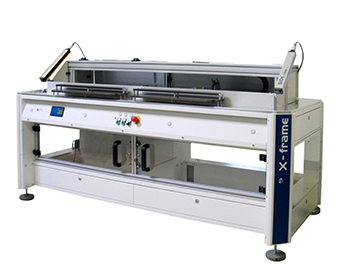 X-frame can be used flexibly and can be easily and quickly adopted to your requirements. Your basic concept is our internal standard for the realization of a wide variety of applications – X-frame grows with your requirements. Modifications and extensions: X-frame can be easily adapted at any time to new customer specifications. Save time and money: You can concentrate on your core business while we support you in the construction of your machine frame. 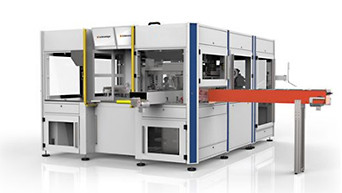 Low-priced one-off production: Owing to its simple construction, the X-frame system is ideal for manufacturing low-priced customized or one-off products. Integrate control cabinets and save money: It is possible to integrate control cabinets on all levels. The control cabinet becomes a supporting part of the cell. Additional cable ducts are not required: The continuously open structure of the X-frame system forms an integrated three-dimensional cable duct. Additional devices or equipment are not required: The simple and modular structure of the X-frame system requires no additional equipment. A one-stop serviced: We carry out the assembly of your X-frame cell, including base plates, windows, doors, safety switches, light curtains and further components of our wide range of accessories. Your benefits: No stockpiling of materials, no further machining of frames or cells, much shorter assembly time. X-frame laser protection cells up to laser protection class 4. Laser and light resistant versions with laser protected windows. Optional also with active laser protection e.g. laser spy. Then contact your personal häwa advisor today to discuss your individual requirements.